The Cincinnati Bengals selected Carson Palmer with the top overall pick in the 2003 NFL Draft. Palmer joined the Bengals after winning the Heisman Trophy while at USC in 2002. Despite being taken at the top of the 2003 NFL Draft, Palmer didn’t play at all during his rookie season. He became the full-time starter in Cincinnati in 2004. Palmer was one of 13 quarterbacks selected in the 2003 NFL Draft. The Detroit Lions held the second overall pick in the 2003 NFL Draft and used it to select wide receiver Charles Rogers. Another wide receiver went at number three, as the Houston Texans took Miami’s Andre Johnson. At number four, the New York Jets selected Kentucky defensive tackle Dewayne Robertson. Kansas State cornerback Terence Newman went fifth to the Dallas Cowboys. 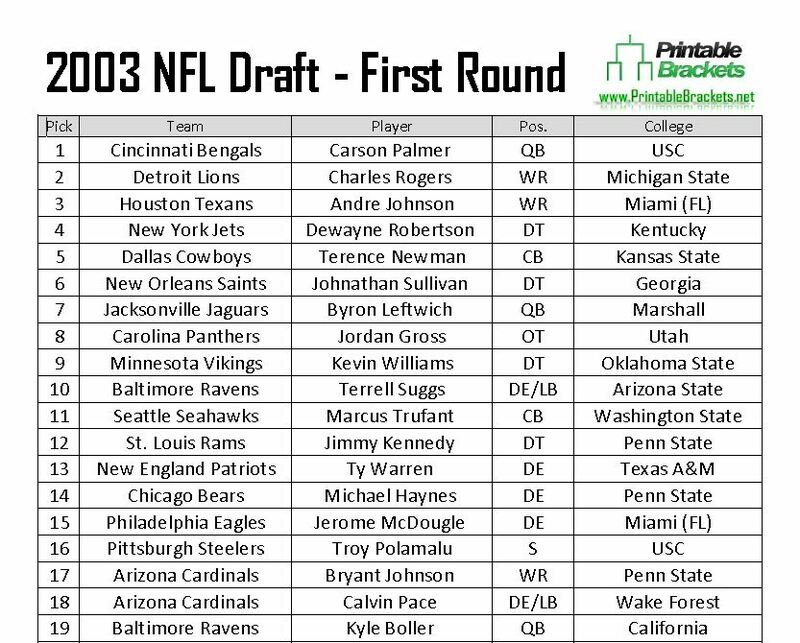 Several future Pro Bowlers were selected outside the top 10 in the first round, including Troy Polamalu, Jeff Faine, Willis McGahee, Dallas Clark, Larry Johnson and Nnamdi Asomugha. The second round was responsible for producing seven future Pro Bowlers. Charles Tillman, Jon Stinchcomb, Rashean Mathis, E.J. Henderson, Ken Hamlin, Anquan Boldin and Osi Umenyiora all went in round two. A total of 262 picks were made in the 2003 NFL Draft, a whopping 49 of which were defensive backs. Another 36 picks were wide receivers, while 30 linebackers, 24 defensive ends, 24 defensive tackles and 23 running backs came off the board. “Mr. Irrelevant” of the 2003 NFL Draft was wide receiver Ryan Hoag, who was selected by the Raiders with the 262nd overall pick. Several notable future Pro Bowlers went undrafted in 2003, including quarterback Tony Romo. Tight end Antonio Gates, linebacker Brandon Ayanbadejo and safety Quintin Mikell were also undrafted free agents after the 2003 NFL Draft.